Every year that I grow peppers, the same thing happens. The whole summer will pass by and I’ll get one or two peppers from each plant. I’m disappointed, wondering what I did wrong, and I vow that I will never (never!) grow peppers again. Then fall starts and suddenly my pepper plants shoot up a foot or so and dozens of peppers appear overnight. Or, at least it seems like it’s overnight. Why does this happen?! Aren’t peppers supposed to love hot weather? Mine seem to prefer brisk mornings and rainy gray afternoons. I considered adding tomatoes or zucchini or something else to veggie up this recipe a little bit since that’s usually my inclination with pasta, but mac & cheese is a dish best made simple. The poblanos add a slightly smoky kick to an otherwise traditional recipe. How much of a kick is up to you, though. 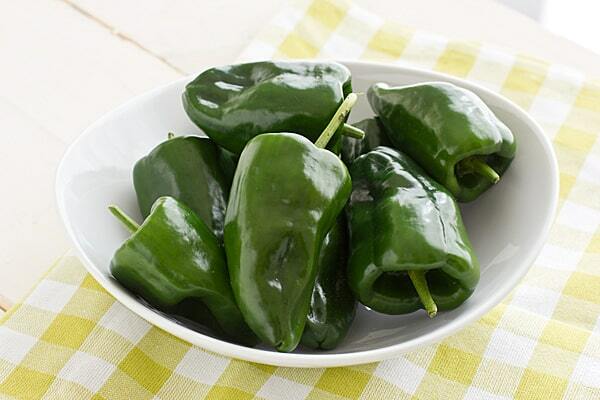 Two peppers is pretty darn spicy, so if you prefer it a little milder, opt for one pepper. Smoky roasted poblano peppers give this lighter version mac & cheese a spicy kick! Turn on broiler. 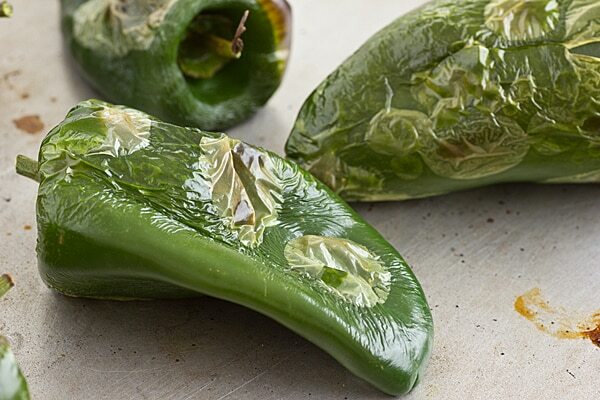 Place poblano peppers on a rimmed baking sheet and broil for about 10 minutes or until skin is blistered and starting to blacken, turning halfway through. Place peppers in zip-top bag for 5 minutes. Remove from bag and peel; discard stems, seeds and ribs. Chop peppers and set aside. Reduce oven temperature to 400 degrees. Combine milk and flour in a large saucepan over high heat, whisking constantly. Once mixture comes to a boil, reduce heat and simmer until thickened, 5-8 minutes, continuing to whisk frequently. Remove from heat. Add 4 ounces of cheddar cheese and 3 ounces of Monterrey jack cheese and whisk until melted. Stir in macaroni, poblano peppers, and salt to taste. 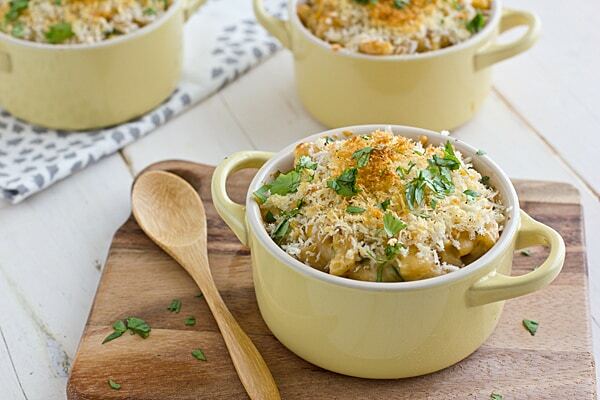 Divide mac & cheese into 6 large ramekins or mini cocottes sprayed with oil or cooking spray (you can also use a casserole dish if you don’t have ramekins). In a small bowl, stir together panko, olive oil, salt and pepper. Top ramekins with reserved cheese and then panko. Bake for 10-15 minutes, or until panko is golden brown. Sprinkle with chopped cilantro. This looks amazing. I am going to have to try it! This is at the top of my list of recipes to try. I’m *hoping* I can make this for Thanksgiving dinner although my grandpa will be there and he shows sensitivities to too much black pepper. 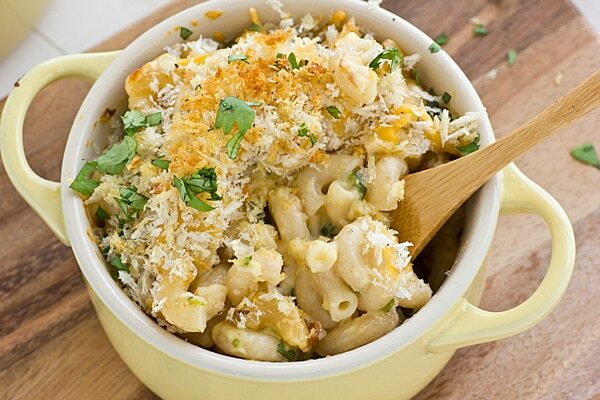 This mixes my loves of spicy foods and mac n’ cheese – perfection! You could always leave the black pepper out. I put it in everything, but with the poblanos, it’s probably spicy enough! Um, I thought it was just me… My pepper plants are the exact same way!! And I say the same things too and then magically overnight I have a ton of peppers. So weird. I haven’t planted poblanos though, but I need to. Seriously, my favorite pepper. This mac and cheese is calling to me! Nope, not just you. 🙂 Which reminds me, I should go out and pick the last of my sweet peppers. I have a ton of those in the garden too! I agree with you that mac and cheese recipes are best simple. The ones with lobster or hot dog pieces are just weird. I like the idea of putting poblanos in! My peppers were the same way — I grew these Thai chili peppers, and they weren’t ready until almost September. Plus I was waiting for them to get bigger, but once they turned red I could see they were tiny peppers, but they pack a hell of a punch. And the plant is still going! What are you going to do with all those Thai peppers? I grew them once and that was it for me because I couldn’t use them all. There are only so many peppers you can dare your husband to eat before he starts wising up. Freeze them, then throw them into random stir-fries or whatever. We put them in salsas in late summer. There’s not actually that many peppers on the plant now, maybe a dozen? It’s now potted, with not much spread. And they’re tiny, like a quarter-inch! They pack a punch, though. I cannot wait to try this, it looks sooo good! Question — when you serve this as a main dish, what goes with it for you guys? Salad? Second question — do you use pre-packaged shredded cheese or block cheese? Are you cooking the macaroni or are you puttinging it in dry?